Zoe loves braided hairbands. I have made dozens for her, enough so she has one for every outfit. Along comes a new outfit and she wants to know where her matching hairband is. So, I decided its time for her to be doing the hairbands. The instructions are here: On the hair hardware site. You will even find the instructions done as video's. Check out the instructions for hair bows too. Love this site, its where I buy all my hair ribbon supplies. I do not have any interest other then being a customer. 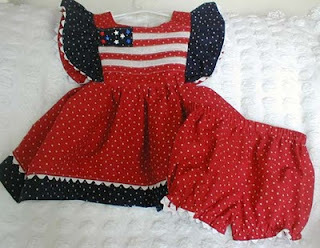 I have made so many of these outfits for the girls for the fourth of July Celebrations. 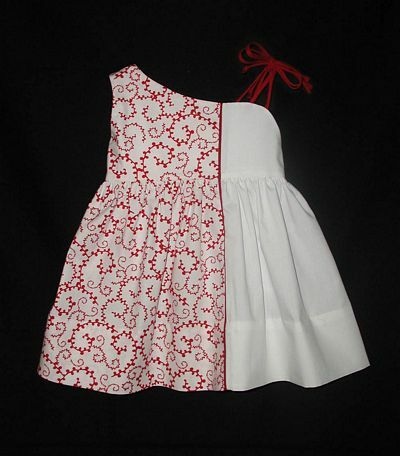 The original was made using a pinafore pattern. Now, with Zoe a little older, the ruffles were just a tad to young looking and her cousin Chloe now lives in a very hot climate which would make the pinafore outfit to warm. So with some sewing talk with my friend Jerry, the outfits were changed to make them a little more 'big girl' looking and at the same time cool for hot weather. 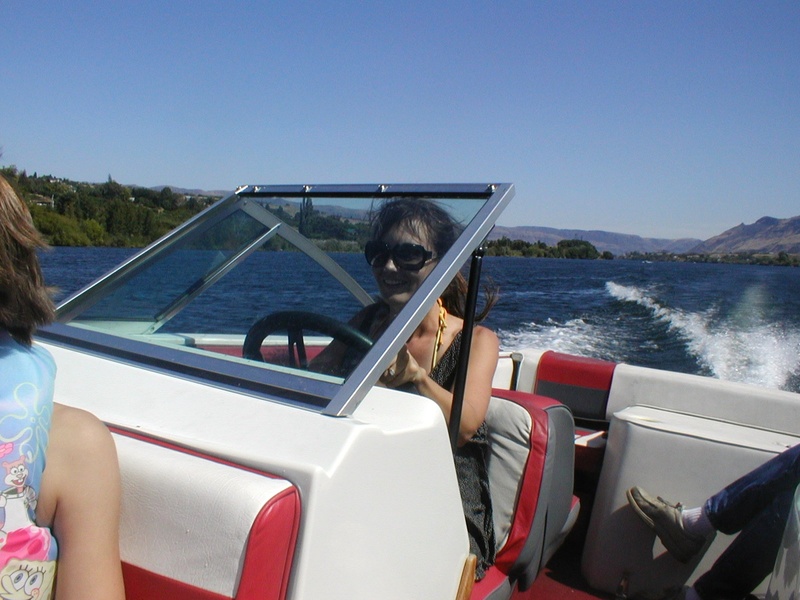 Now, I hope to get the girls together sometime this summer and have them model their outfits together. A closer picture of the flag: You will need to adjust it for the size of outfit you are making. It is hard to give a definite size to the flag, as it will depend on what you put it on. 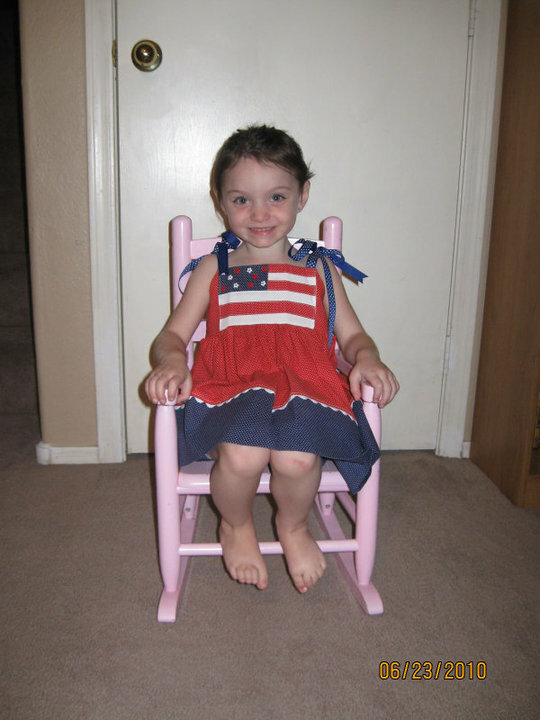 On the pinafore, I had no arm holes to consider, the flag takes up the bib. So, for a sundress or a jon-jon that has a straight bib, just make the flag fill the whole bib area. I cut a 2-1/2"x4" piece from the navy. strips are two red 1 1/4"x5 1/2" and two strips 1 1/4"x 9". After I sewed the flag together I backed it with white broadcloth, sewed around three edges leaving the bottom open for turning. 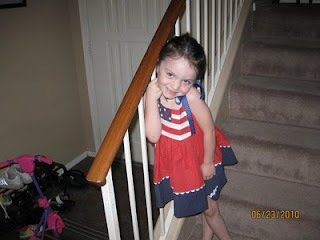 Because the bottom of the flag is attached to the skirt, I did not sew up the bottom. 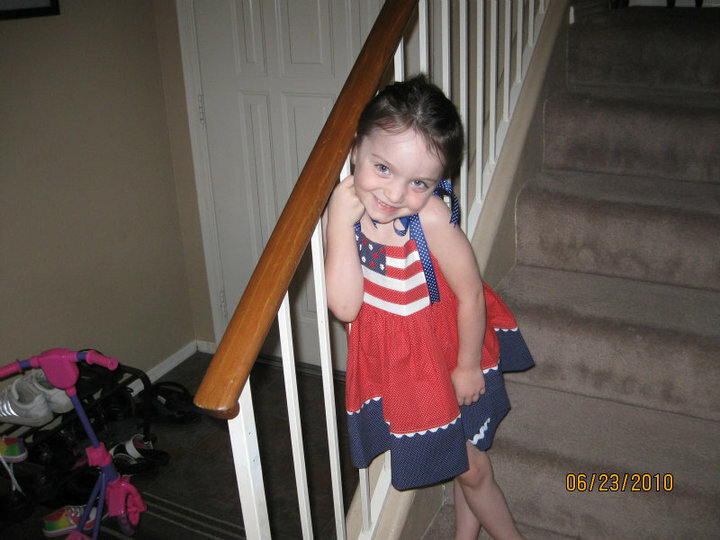 After I turned the flag and pressed it, I placed it on the bib of the dress. Quilted the stripes. On the pinafore, I backed the flag with cotton batting, which makes the flag look nice but is heavy. Peace and Love, the motto of the MS foundation. We are a little more at peace with the diagnoses of our daughter having MS. We sure do love her, so the motto works for me. It has taken adjustments for her family as everyone moves into the support mode. I am sure she has thought "why me" but has never spoken the words out loud. Just thanks the Lord for what ever blessings he has in store for her. Knowing this is a blessing and not a curse. Her body is slowly adjusting to the daily shots, at first she had a horrible reaction to them and we were afraid maybe she would have to do something different for treatment. Thank each of you for the prayers, they mean so much. Also thank you for the links you are sending where we find even more information. I know it has been awhile since I posted and thought you might like an update. As far as sewing, I do have some outfits for Zoe and Chloe that are just about finished so I will be able to share those, I hope this week! Also working on a tiny little project with Betty. The more we think about it the more excited we get, it is one of those projects that cause the imagination to go wild. Although a tiny, little project I think it is taking on a life of it's own. Yes, we are still working on our basic bodice. 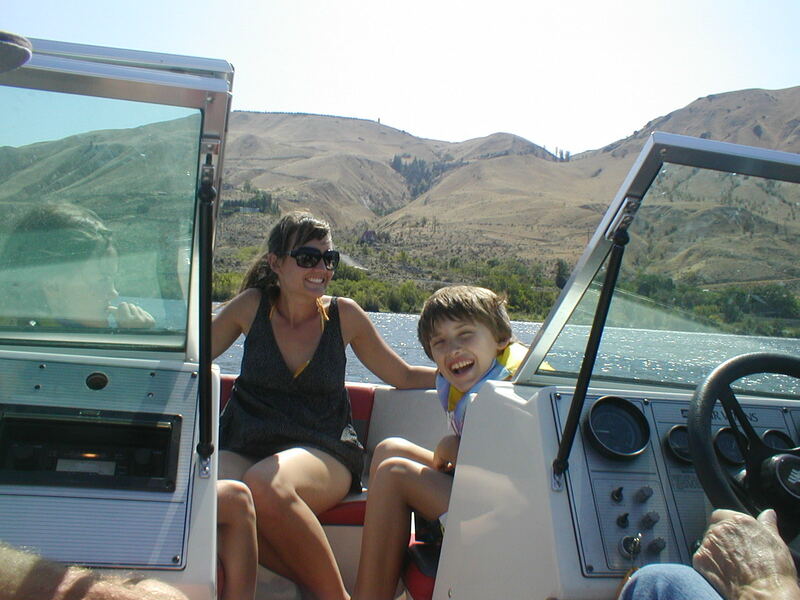 Once you have chosen a basic bodice pattern, you can change it to your hearts content. Lets say, the pattern you like has a zipper back closing and you really want a button back closing. What do you do? You go to our sewing mentor Betty and ask! Betty worked up the instructions for you on how this is done. Just a side note here to Karen, this is what you have been asking for. We will be doing more changes to the basic bodice pattern, so check back often. Changing zipper bodice back to a button closing. I like to use sew in Pellon for pattern tracing, it won't tear and I can write on it. Trace full zipper pattern piece marking a line on "center back". Measure 3/8" from center back line and draw another line for a button closure turn under line, I tried to do this is RED for it to show up. turn pattern over fold facing on red line, the 3/8" line and finger press. tuck edge of facing under to first crease and finger press. cut out pattern now. Sometimes the facings are on the neck curve is the reason for this. open up and draw line on second crease. Cut out fabric, clip into top and bottom seam allowances at turn under lines for as easy straight fold guide. Iron press after each fold. Treat the second fold as one piece if inserting collar or facings. If you prefer just a basic turn under facing, or one to attach a lining to, add only 1 1/4" to the cutting line. This will give a 1 1/2" turn under allowing for a finished turn under of 1/4" or a seam to attach a lining if desired. This is a dress made by Betty D. Showing how you can use the basic bodice pattern to make a whole new design. The instructions were shared on Everythingsewing web site. For instructions which include pictures vist La sewista's blog. 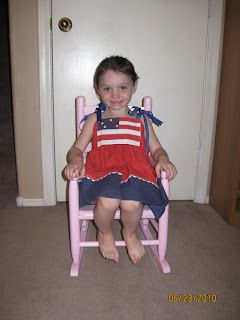 She did a wonderful picture tutorial making this dress step by step. I will just re-post the instructions as given by Betty as I don't think I could do as perfect a job as Bunny has done showing step by step instructions. 1. Trace one full front and two backs of a bodice pattern. ( I use light weight sew in pellon because I can write on it and it is sturdy ). Fold center backs on the fold line and cut lining for bodice (three pieces), put it aside for a long time, don't lose it. Lining only goes to fold line. 2. Draw a line on the front pattern starting on the stitching line of the right shoulder, going across the front as low as you want, and curving to the other arm hole. Cut the extra off allowing for a seam then match it up with the back pattern and cut the extra off that one too. Mark a line/notch for both center backs . 3. Draw a vertical line on the front pattern past center front, match up the back pattern with another vertical line. Be sure to use the correct back. Now put an arrow and note to add seam lines, cut both front and back on these lines.. Line up the pattern pieces, should have 6, left to right starting with FULL BACK- LARGEST FRONT- SMALL FRONT- SMALL UNDER ARM BACK-CENTER BACK. Put a "X" on each piece to indicate the top. ALSO mark each one IF it will be the PRINT or SOLID. (ask me how I knew to do this *-*) Cut these out on correct fabric and sew together at the under arm seams LEAVE shoulder seam unsewed. 4. Measure the printed bodice top and the solid top both at the waist. Allow one and a half OR twice for the skirt pieces.Cut these two skirt pieces out (correct fabrics) allowing for hems and seam allowances. Measure the back printed short piece at the waist to center back, allow for gathers and make a slit at center back for a placket and finish it. Next, sew the printed top to the printed skirt and the solid top to the solid skirt. 5. Time to make the cording. I use the 100% cotton "peaches n cream" and I also preshrink to be safe. Cut bias strips and sew enough together for the cording full length of dress front and back. Sew enough bias for the four spaghetti straps, no cording in these. Sew cording in at the start and anchor well, don't sew right next to the cord, give a little room to turn. After sewing, trim seam to fit in the turned straps, then pull on the cord to turn. 6. Sew cording in the front between the two fronts, doing the same for the dress back. Cut the spaghetti straps into four lengths. Pin two on the front hanging down and the same on the back, line these up to match front. Right side together, pin lining across the top, fold back facings on fold line and pin the lining on top. then sew across top. Trim seam and press toward the lining......understitch. Turn lining back RST and sew the arm hole, beginning and stopping ONE INCH from the shoulder on front and back seams trim, and turn lining back to inside. Sew shoulder seam, trim a little and finish the lining there by hand. Pin bottom of lining to the waist and hand sew to finish. 7. I prefer a not too wide sash for this dress, cut a length of your choice about 3 1/4" wide, sew long side and taper at the ends, turn. Remember to cut one print and one solid. Sew these on the correct color side seams with ends toward front, trim and stitch/zig-zag near cut edge, fold sash toward back and bar tack in two/three times to hold in place. Hem, button holes, and buttons. 8. PM me if you need help understanding my instructions, will do my best to explain. Promise to share pictures, the choice of fabrics etc. make each one different. It has been a few days since I have posted here as sewing has been put on hold for a bit. I have been trying to digest the news that our daughter Janel, has been diagnosed with MS. A disease I have only heard about but have no knowledge about it. I thank my many friends for sending links to web sites where I can learn more. It is a dreadful disease, with no known cause and no known cure. This has caused a big change in our family. Janel is not one to sit around and feel sorry for herself. She intends to live life to the max!! We are learning about things like cooling vests, the color orange and the Nancy Davis foundation. This is a link to her story. I do hope, that given a chance you will be able to donate to the foundation, but more then that I ask for your prayers.